Bruce Stout has led Murray International since 2004 and he is never shy to give an opinion on the state of the global economy. He reckons most Western economies have yet to deal with the debt problems that caused the financial crisis, so he looks for more genuine growth elsewhere, mostly in Asia Pacific and Latin America. As a result, Murray International is underweight the US, UK, Europe and Japan compared to most global funds and trackers. That stance has caused it to underperform its peers over the past six years. However, as this chart from Kepler Trust Intelligence shows, Murray International had a terrific run from 2003 to 2012, beating the MSCI World index every single year (blue bars for Murray and orange for MSCI). 2013, 2014 and 2015 proved to be a lot tougher. The US markets did very well while emerging markets had growing pains. 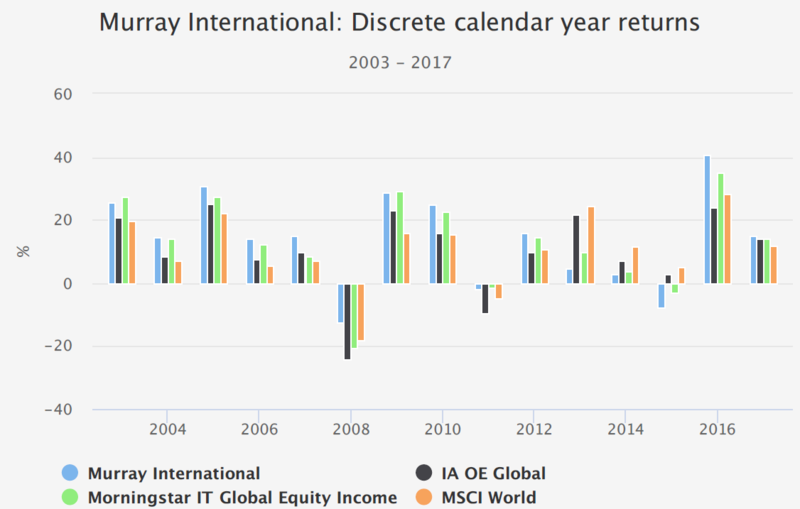 Murray International bounced back strongly in 2016, though, and has largely matched global indices the past two years. Like many ancient investment trusts, Murray International has changed a lot since it was first set up, although it’s had an income focus throughout much of its existence. It can trace its roots back to 1907 when it was known as The Scottish Western Investment Company. Back then it invested mostly in international bonds but it gradually shifted more and more into equities, particularly in the 1930s and 1940s. However, as the 2004 accounts say, “bond defaults [caused by the depression] forced the purchase of higher-yielding equities to fund the costs of the trust’s gearing. The Managers were not slow to spot an opportunity, but it started as Hobson’s choice, and was only later trumpeted as brilliant foresight”. For a long time, the trust used its accountants as its investment managers until these roles were split in 1969 with the creation of Murray Johnstone. This firm remained the fund’s investment manager until 2000 when it was taken over by Aberdeen Asset Management, who then merged with Standard Life in 2017. The trust was briefly known as Murray Western from 1979 to 1984 before adopting its current moniker of Murray International. 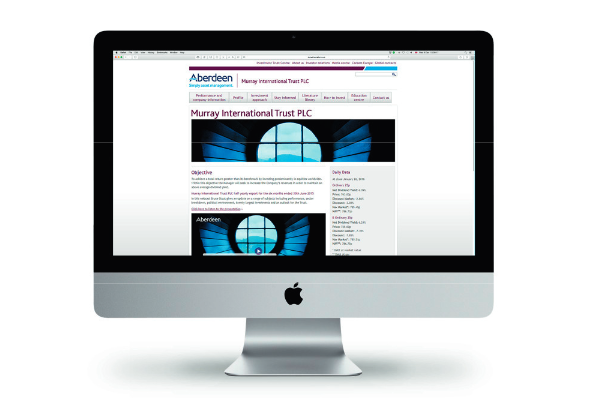 For those who like to delve into the history of investment trusts in more detail, there is an excellent publication on the Aberdeen website that should cover all you need to know. Notes: Interims are paid in August, November and February. They are usually the same amount, with the level being set at the time of the Annual General Meeting in late April. The final is announced in March and paid in May. The 2010 final includes a 2.5p special dividend. 2004 through to 2012 saw spectacular dividend growth, matching the impressive capital performance of the fund at the time. The dividend has continued to increase every year since but at an average rate of 3.7% over the last 5 years. The high payout is possible as the companies Stout invests in often have fairly chunky dividend yields, and this is boosted by selected fixed-income securities and the trust’s usual low double-digit rate of gearing. Murray International’s current revenue reserves cover its annual dividends about 1.1 times. Most recently, 1.8p was added to revenue reserves in 2017 but 1.9p was taken out in 2018. Stout says that whether the fund adds or dips into revenue reserves usually reflects the strength of sterling over the course of the year. So, it seems reasonable to expect revenue reserves to remain at roughly the same level in future, barring any major mishaps. To add a little more historical context, dividends rose from 1.5p in 1980 to 9.2p in 1989. The growth in the 1990s was a lot more sedate, climbing to 15.2p by 1999. The dividend also remained at 16.3p from 2001 to 2004. It’s hard to separate Bruce Stout and Murray International. He’s been involved with the trust since the early 1990s, then acting as the deputy to the previous manager, David Briggs, who was in charge from 1988 to his retirement in 2004. However, Murray International’s portfolio has changed dramatically under Stout. When he took over, UK equities/fixed-income securities accounted for more than 40% of assets. Now, it’s down to 10%. About forty UK shares have been whittled down to just seven: HSBC, Standard Chartered, Shell, BAT, Vodafone, satellite-owner Inmarsat (which is being taken private), and oil-equipment company Weir. As you can see, most of these are focused outside of the UK and particularly in Asia. Other investments follow a similar thesis, such as a 1.4% position in Auckland airport that’s predicated on growing demand from Chinese tourists. Stout turns 61 this year. However, I don’t see any obvious successor or back-up team mentioned in Murray International’s recent reports. He has a few more years until normal retirement age, of course, but his departure may not be that far off. What’s more, the merger of Aberdeen Asset Management and Standard Life hasn’t gone that smoothly, so that’s an additional question mark over the long-term future of this fund. For more on Stout’s way of thinking, there is a recent Moneyweek interview here. It’s 43 minutes long — the first third has more detail on Murray International while the remainder touches on more macro concerns such as the weakness of the banking system and the ever-present nature of the economic cycle. The top 10 investments account for 32% and the top 20 52%, so it seems pretty well diversified. There’s a good piece of (paid for) research from Edison that covers the investment process at Murray International in some detail. Companies are initially selected from Aberdeen’s buy list of stocks around the world, which covers about 900 companies in total. If companies come off this list then Murray International has to sell them within 30 days. Initial position sizes tend to be around 1.0% to 1.5%, with the current portfolio weightings reflecting their performance since purchase rather than any particular call on how favourably they are viewed. Positions are trimmed if they exceed 5%. However, it’s a fairly low turnover portfolio. Stout reckons in a typical year that three new companies come into the portfolio and three leave. About 50 are held in total. Many of the top holdings have been held for 10 years or more. For example, Aeroporto del Sureste has been in the portfolio for 20 years and Taiwan Semiconductor for 15. The yields on some of these stocks can be surprisingly high. Taiwan Mobile was recently 5.5% and Daito Trust 4%. Stout doesn’t seek to match any global index weighting, so new investments are selected on their own merits. He looks for growth at a reasonable price backed by a strong balance sheet, rather than a deep value approach (i.e. cheap stocks without any particular concern about their growth prospects). Stout often adjusts the percentage of equities and fixed-income securities depending on his view of the markets. Prior to the financial crisis, fixed income accounted for around 25% of assets and consisted mostly of US and UK government bonds. That helped pare its losses considerably. By 2009, with equities then yielding more than twice the rate of bonds, the proportion of fixed income fell to just 8%. Stout also increased his fixed-income weighting in 2015. This time, emerging-market debt was the instrument of choice, after a sell-off in emerging-market currencies. That helped the fund’s performance in 2016 when it bounced back strongly. Murray International sits in an odd little AIC sector called Global Equity Income. It only has seven trusts and accounts for just over £3bn of assets. In fact, Murray International accounts for around half the sector. The next largest funds are Baillie Gifford’s Scottish American and another of my holdings JPMorgan Global Growth & Income, which are around a third the size of Murray International. You might have thought, given the current investing obsession with income, that global equity income funds would be a lot more popular. But it seems like we don’t like to venture too far afield in the hunt for yield. The UK Equity Income sector is about four times as large, with 23 funds and £11.5bn of assets. Compared to the more mainstream global sector (20 funds and £26bn in assets), the performance of the global equity income sector has lagged a bit the past decade. Global equity income is up 247% in net asset value terms compared to global’s 366% (in no small part due to Scottish Mortgage’s excellent performance). Global equity income has been a bit more consistent, though. The five funds that have a 10-year track record range from Murray International’s 215% to Scottish American’s 302%. All five have beaten the MSCI World’s 170% gain, although there may be some survivorship bias at work here. One niggle I do have with Murray International is the benchmark it uses to gauge its performance. It’s 40% FTSE World UK and 60% FTSE World ex UK. For some reason, I struggled to find a definition for the FTSE World UK index, but I am guessing it’s purely UK. Assuming it is, Murray International’s 40/60 hybrid benchmark is looking rather outdated now the UK weighting of the fund is down to 10%. Murray International does acknowledge that the ratio is largely for historical reasons, but given the portfolio has looked pretty similar for many years now, a formal change to straightforward global index seems well overdue. Like most investment trusts, Murray International traded at a discount to net assets before the financial crisis. Since then, however, it’s usually traded at a premium, sometimes as high as 10%. It dipped to a discount most recently in 2016 and in late 2018, but a strong share-price performance in 2019 has seen it climb to a 5% premium again. For what’s largely a straightforward equity fund, I think it’s hard to justify paying too much of a premium. However, other large and popular income-focused funds, such as City Of London Investment Trust, often trade on a similar rating. As a large, low-turnover fund, you wouldn’t expect Murray International to be that expensive. And it’s not. The annual management fee from 1 January 2019 is 0.5% of Net Assets up to £1,200m and 0.425% of Net Assets above £1,200m. For the year ended 31 December 2018, the annual management fee was charged at 0.575% of Net Assets up to £1,200 million, 0.5% of Net Assets between £1,200 million and £1,400 million, and 0.425% of Net Assets above £1,400 million. Admittedly, it’s a small cut but the direction of travel is important in such matters. Cutting the tiers from three to two simplifies things as well. Murray International gets a fair amount of flak for its performance over the last several years. But given it’s deliberately avoided many of the big tech stocks that have driven the US market, I think it’s actually done pretty well. And its longer-term performance since Stout took charge demands respect. It’s in my portfolio because it does something a little different and has a broad global remit. The income it pays out suits my purposes right now as well. If it happens to dip to a decent discount at any point, I may even consider a little top-up. The biggest question mark over the fund is probably what happens when Stout retires, but hopefully that’s a few years away yet. Next Post: Q1 2019: Are You Sitting Uncomfortably?